Does Samsung really have a dual-aperture advantage? Samsung always has one of the best cameras in a smartphone, let's see if the S9+ can take the top spot from the Huawei Mate 10 Pro. Samsung’s flagship Galaxy S9 family has arrived with what Samsung is calling a “reimagined” camera. Just like the Galaxy S8 before it, the main rear camera on the S9+ features a Dual Pixel 12MP sensor with Optical Image Stabilization. But this time around, Samsung has introduced Dual Aperture technology as well. Is it a game changer? That’s what I intended to find out. All our testing mimics how people use phones in the real world. Read on for my complete tests, which are part of PCWorld’s Last Cam Standing series. At the end of the article, I name whether the Galaxy S9+ is the best smartphone camera you can buy today. You can also read our full review of the smaller Galaxy S9. Our Last Cam Standing tests are organized like King of the Hill-style battles. We gather an assortment of the best smartphone cameras we’ve recently tested, and whichever phone produces the best images and user experience moves on to face the next major smartphone release. Head over to PCWorld’s YouTube channel for the 4K version of the video at the top of this article. The reigning champ for two matches so far is Huawei’s Mate 10 Pro. It boasts impressive Leica hardware and AI-powered software in a single, high-end camera package. Of course, the new Galaxy S9+ is on deck to fight the Mate 10 Pro, but I also re-tested Apple’s iPhone X, which recently lost to the Mate 10 Pro in a showdown late last year. And even though it has no chance of winning, I tested the Galaxy S8 as well. This should give us a great idea of just how far Samsung has come in 12 months. As always, we divide our testing into four categories: color, clarity, exposure, and user experience. 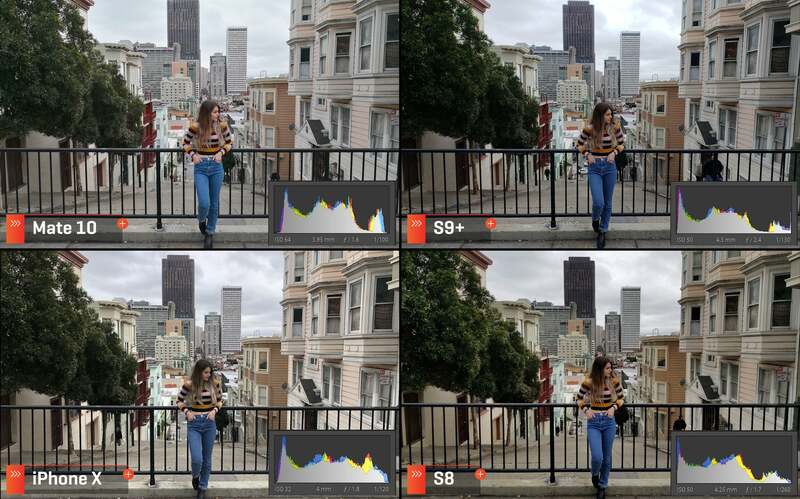 It’s critical to note that we evaluate smartphone images the same way we would evaluate DSLR images: We dig into the actual pixels of the test shots, and assign a high value to color accuracy and dynamic range. The upshot is that sometimes “pretty” photos aren’t always the best photos, because we want photos that give us the greatest editing flexibility (be that in Photoshop or Instagram). That said, all our testing mimics how people use phones in the real world. I just pull the phone from my pocket, and use the stock camera app with HDR processing set to auto. For this round of testing we also hired Victoria to model for us—be sure to go check out her Instagram! The first category is color, and we’ll be going over color accuracy and white balance. This first shot with Victoria hanging out it in San Francisco’s Chinatown plays out just like we’ve seen in past tests. The Mate 10 is more desaturated and leans to the cooler side, while the iPhone leans warmer and is very saturated. 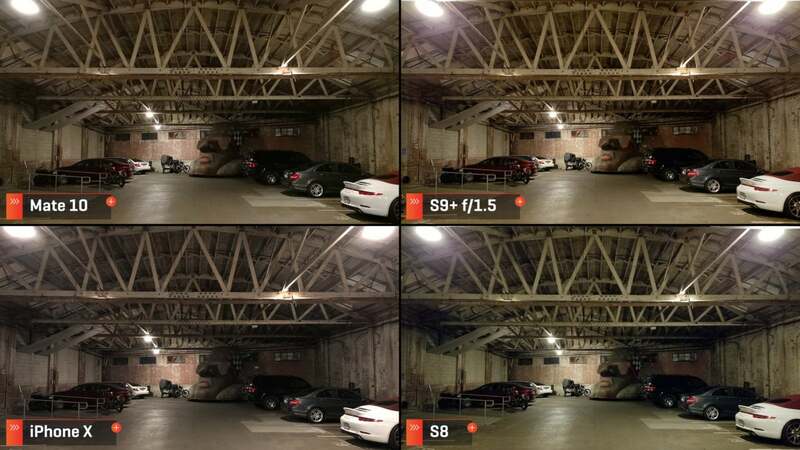 The S9+ is a little closer to the Mate 10 than the S8, which surprisingly delivered the most natural color. Moving inside the store, and it’s almost the opposite. The iPhone 10 is desaturated and counteracts the yellow lights very well. 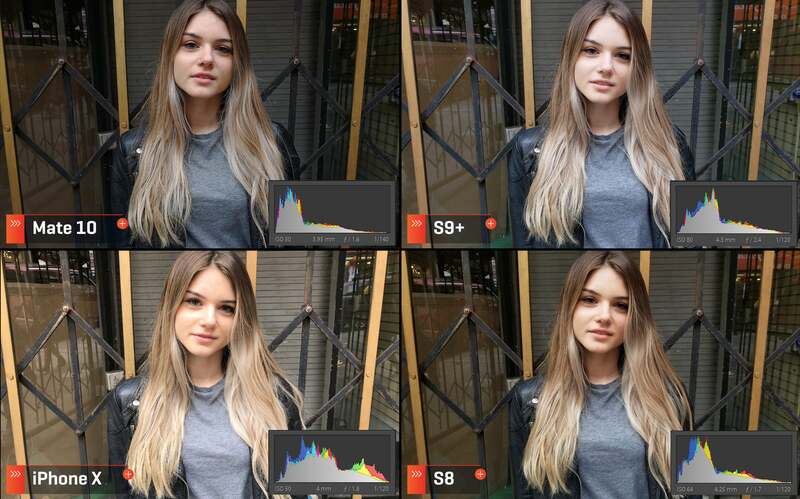 The Mate 10 turned the model’s hair red, while the S9+ produces a yellow hue over her face. Back on the street, color reproduction is a little more even. In the photo above, study the skin tones, the blue jeans, and the yellow stripe on Victoria’s shirt. The colors on the iPhone 10 are just a bit too oversaturated for my taste, while the S9+ is too cold. I’d personally go for the Mate 10 because it looks more natural to the eye. Same thing in this shot above. The concrete is just too warm on the iPhone and the Samsung phones are both a bit cooler than the Mate 10. Now this last shot is really telling, and the results speak for themselves. The iPhone is oversaturated and blown out, while the S8 is very warm and muted. The Mate 10 and S9+ are pretty close, but the Mate has a more pleasing skin tone. 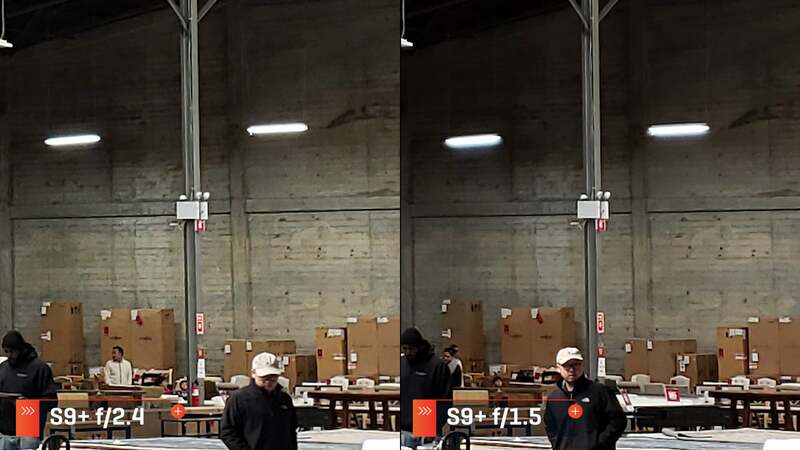 Overall, this color showdown is a close one and the S9+ keeps up, but the Mate 10 was more consistent in its white balance readings, and didn’t oversaturate images. So I’m giving the Color win to the Huawei Mate 10 Pro. The second test category focuses on clarity. 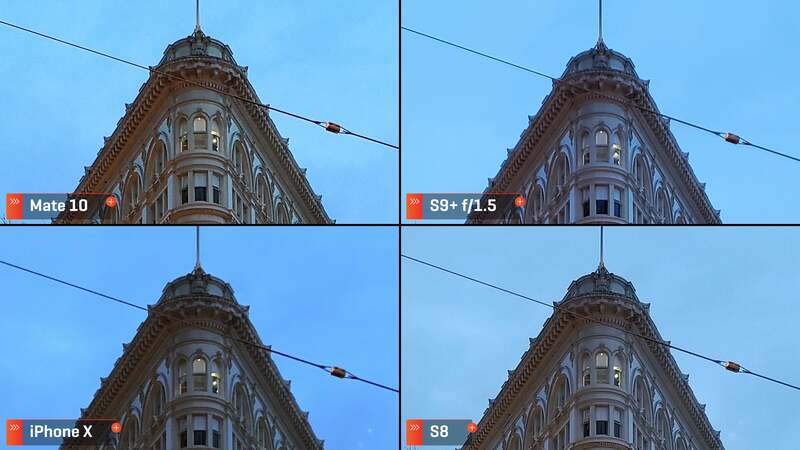 Here we look at the sharpness of each camera, and how well it stays sharp in dark environments. For the S9+ I’ll note the aperture value the phone choose to shoot in. First up is my go-to shot of a brick wall. 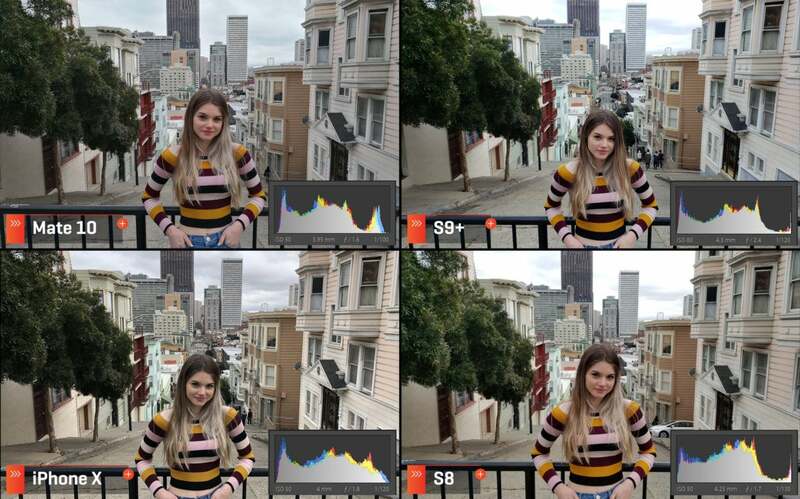 Zooming in reveals a massive amount of sharpening on the Samsung phones, but that’s Samsung’s trademark. Interestingly, the iPhone is soft around the edges, but the Mate 10 has the best texture here. 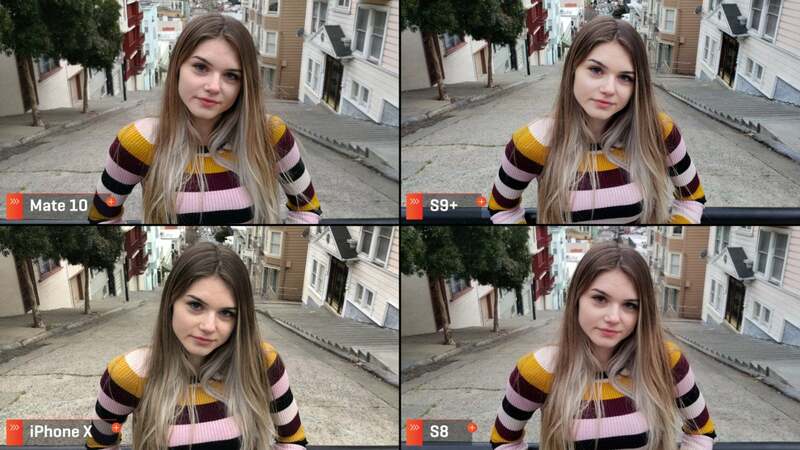 Here on the steps, I’m surprised by just how soft the letters are behind the model in the S9+ photo. 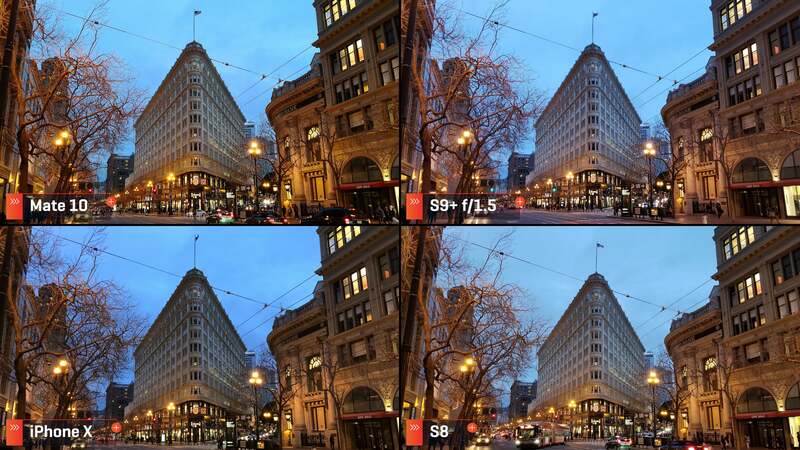 Samsung says the camera’s aperture closes down to f/2.4 in order to stay sharper, which should theoretically be true. 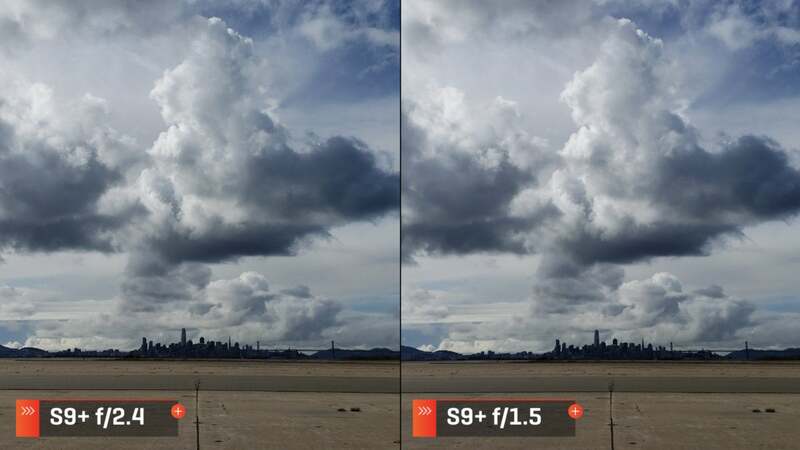 But at f/2.4, the phone should also be able to keep the object in the distance in focus. But that’s just not the case. Same thing on this wide shot here: The Hilton sign should be sharper than that when the S9+ is stopped down. 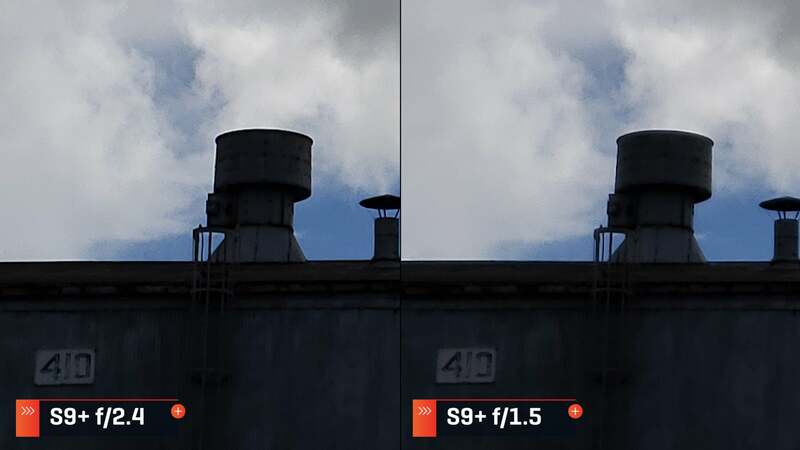 So it got me thinking: Could f/1.5 be even softer? 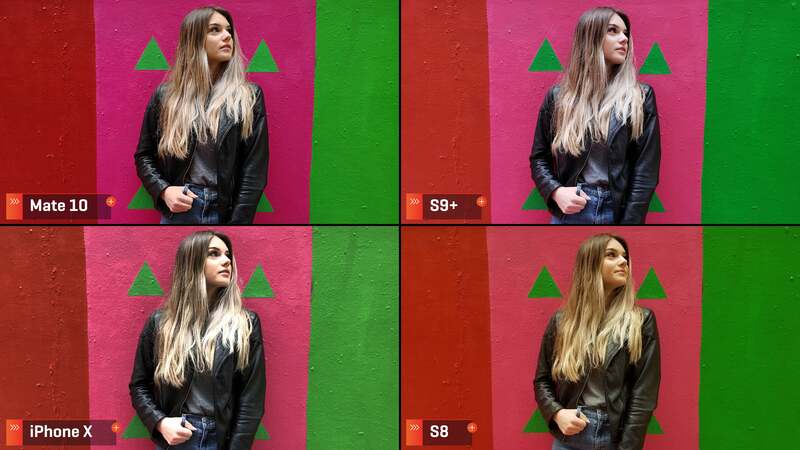 Switching to manual mode on the S9 lets you manually toggle between f/1.5 and f/2.4. And shot after shot, I didn’t see a huge difference in terms of sharpness between the two aperture values. 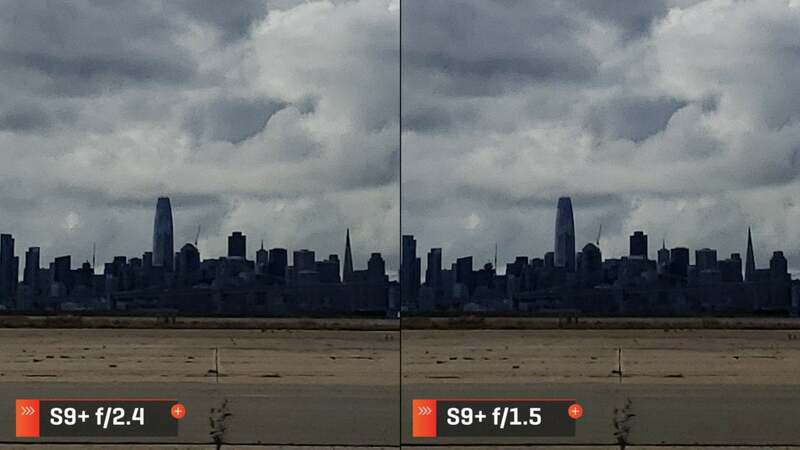 If Samsung included dual apertures so that the f/1.5 could help in low light while allowing the f/2.4 to maintain sharpness in bright light, then I’m not seeing it. In fact, for the most part, I can’t find a reason why Samsung couldn’t just let the camera stay at f/1.5 and call it a day. This whole “dual aperture” thing just doesn’t bear out in real-world results. So, back to the rest of the phones. In bright lighting scenarios, the Mate 10 has the sharpest images. 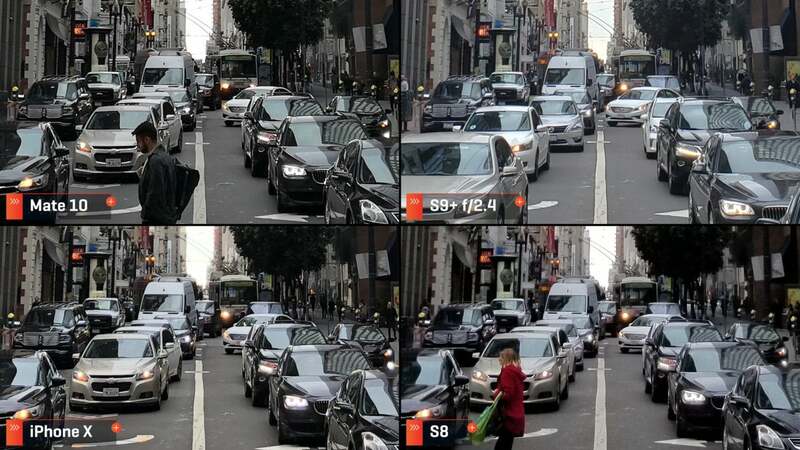 Both Samsung phones exhibit a weird ghosting pattern around the cars here, which doesn’t help clarity overall. Even at dusk, this shot of a building is sharper on the Mate 10, and at such great distances, the iPhone comes in second. Also, the S8 actually does better than the S9+ here. Now we move into some very dark scenes to check out low-light performance, because here is where Samsung shines. This wider shot is impressively sharp on the S9+—just check out the spokes on that motorcycle. The Mate 10 and iPhone keep up, and even the S8 does pretty well. Moving in a bit closer to the wall, and we have a surprise! The S8 kills the S9+. In fact the Mate and iPhone are even clearer than the S9+ in this shot. 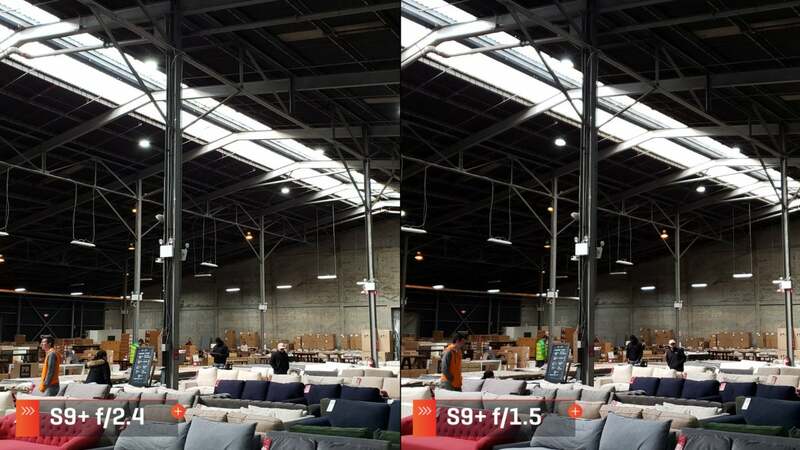 So, while Samsung does some impressive things in low light, the S9+ is inconsistent whereas the Mate 10 is solid throughout every lighting scenario. The Huawei Mate 10 Pro wins the clarity section as well. The third test category is exposure. 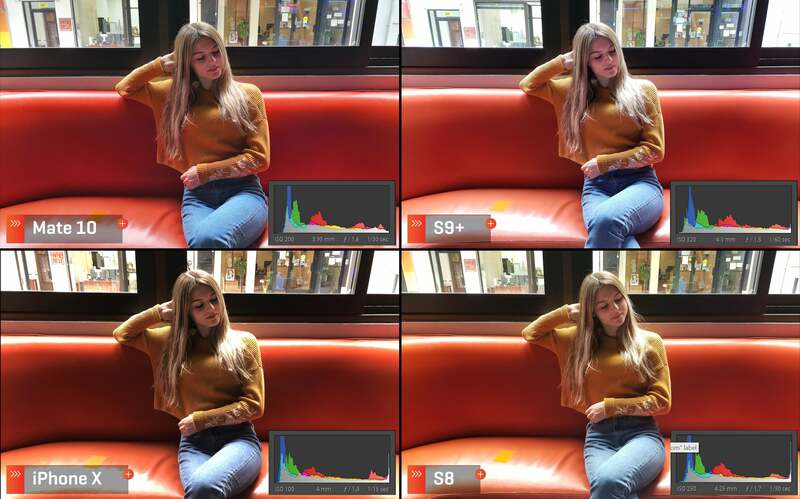 In this one, we cover how the camera exposes for a scene, and find out just how much dynamic range is retained in the shot. I’ll be including histograms in this section so you can get even more detail. Let’s start with a nice city shot. The Mate 10 and iPhone 10 both capture a pleasing exposure and retain plenty of information in the extreme ends of the histogram. But the S9+ and S8 both overexpose the sky, losing some cloud detail and color. 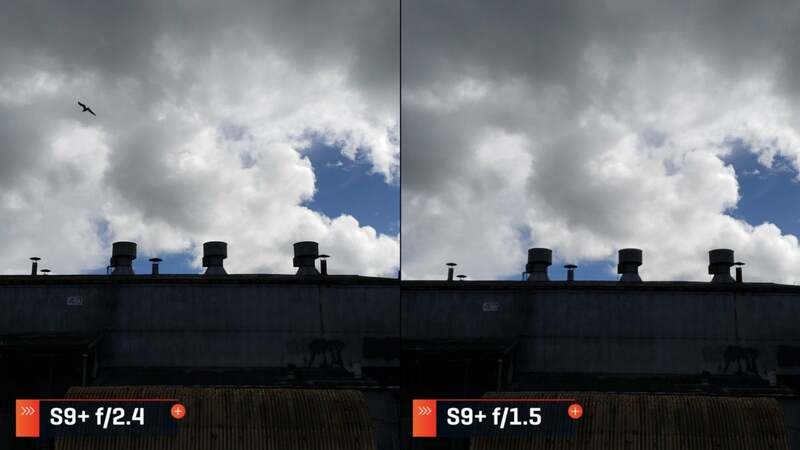 Same thing happens here: The sky is blown out on the S9+. The shot on the Mate 10 is flatter, but if I was to edit these photos I’d rather add contrast into the shot than try to take it out. But here the S9+ does better. 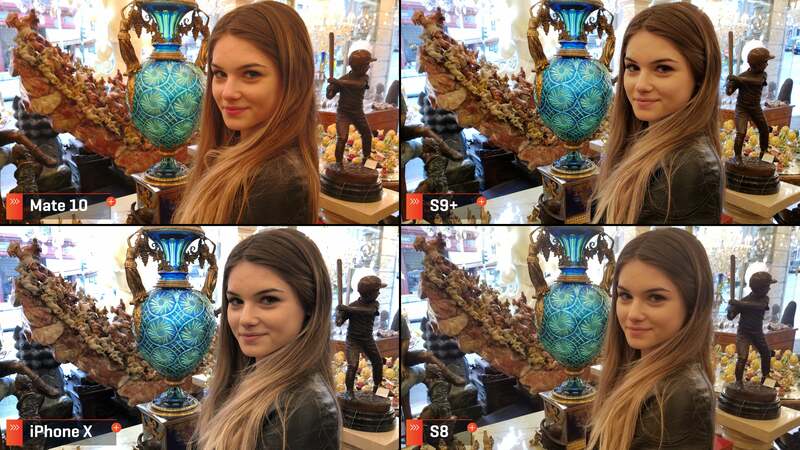 The Mate 10 is a bit underexposed, and the skin on the model in the iPhone shot is blown out. The S8 is on the darker side, just like the Mate 10. This next shot should reveal how the cameras handle backlit scenarios. Every phone other than the Mate 10 blows out the highlights on the red bench and white wall in the background. Focusing just on the face, the Mate 10 also feels the most natural and evenly exposed. In this first alleyway shot, Victoria looks ghostly on the S9+. She’s not too bad in the Mate 10 shot, but I actually prefer the iPhone exposure here. It’s a more even exposure while still delivering some depth in the shadows. 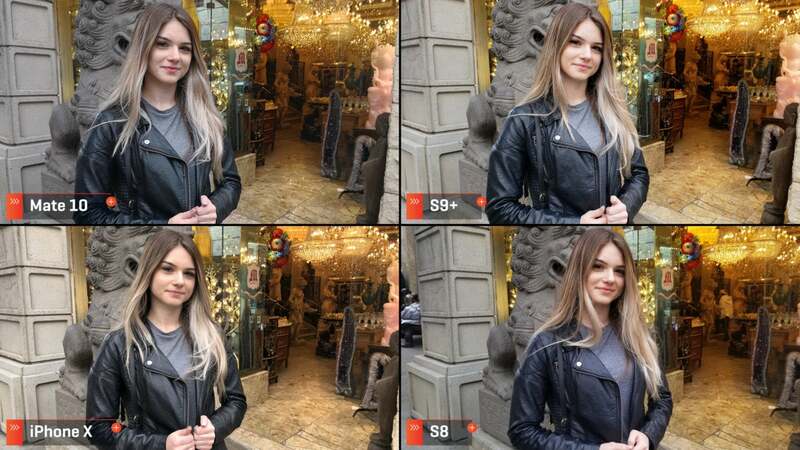 This last photo has the S9+ once again exposing the model’s skin too brightly. It’s a fine line between having a punchy image with contrast that adds depth and retaining information in the exposure, but the iPhone feels too processed here, so I’m going with the Mate 10’s shot. Both Samsung phones lost information from overexposure in too many scenarios, and the iPhone tended to blow out skin tones. The Mate 10 underexposed in some scenarios, but didn’t loose anything that couldn’t be brought back in editing. So, Huawei’s Mate 10 Pro goes three for three, taking the exposure category. The fourth and final test category looks at user experience. Here I get into what it’s like to use the camera day to day, and turn my attention to special features in the camera apps. We’ll start with the Mate 10. It has a fast and powerful camera app, but it’s not the most user friendly. Trying to find the Pro mode isn’t very straightforward, and unfortunately that continues through the rest of the app’s menu features. But Huawei does have an amazing black and white mode, using a secondary 20 megapixel sensor. Cap that off with Huawei’s AI-powered scene and object recognition, and you have a great and reliable user experience. For the S9+, Samsung has redone its app layout to something that iPhone users will recognize. It’s pretty straightforward and easy to use, and has a fun AR Emoji option built right in. But I had a couple of problems using the S9+ app daily. First off, I found switching between modes to be very slow. As I was testing out Dual Aperture in manual mode, I was dreading trying to to get there over and over again from auto mode. And then there’s Bixby Vision, which always pesters you in auto mode, and man, is that frustrating. The iPhone X is fast and easy to use, but I don’t like how long it takes to launch the camera. On all the other phones, you can launch the camera app with a double press of a button, which is something I can do before even looking at the phone. The iPhone X, on the other hand, makes you raise the phone, then long press on the camera icon to launch. That’s too slow for me. But, once again, Apple’s camera app is definitely the most easy to use once you’re inside it. And finally we have the Samsung Galaxy S8. This phone has been out for a year now, so it’s a known quantity at this point, but it delivers a solid experience nonetheless. My biggest pain point while using the S8 is the lack of a second lens for doing fun things like Portrait Mode. 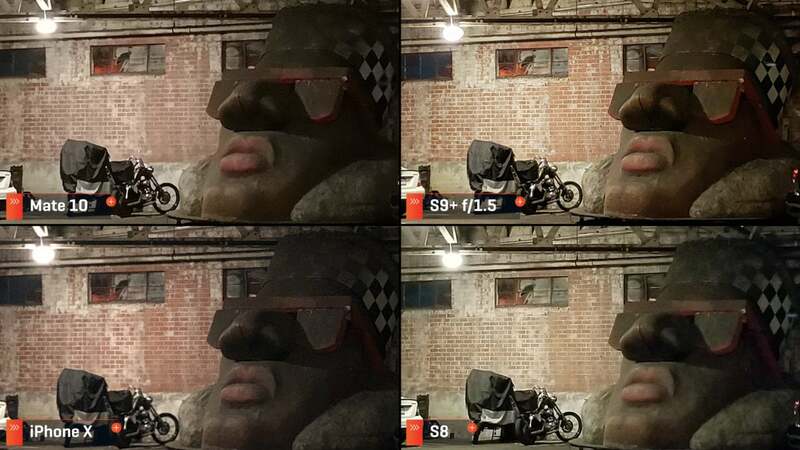 Speaking of Portrait Modes, I did do some quick testing between the three phones that have it, and I didn’t find any huge improvements to the edge detection. I still use these portrait modes all the time, but can’t wait for further advancements in the tech. 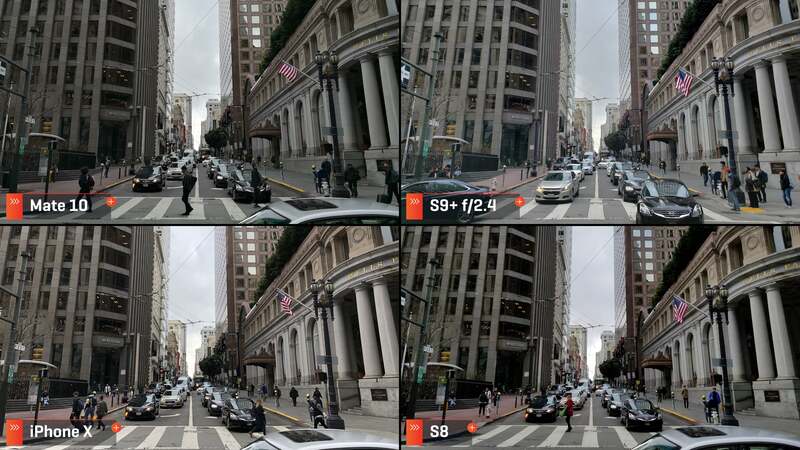 I lean toward the Mate 10 Pro, with it’s wider field of view, but each option has it’s problems separating foreground content from background content. At any rate, at the end of the day I continued to love using Huawei’s Mate 10 Pro, which takes the user experience category with a ton of innovative features. So to close it out, let’s crown a winner. The S8 is still a very good camera that excels in low light, but it’s been surpassed by the S9+ in almost every way. And while the iPhone X keeps up with the pack, it wasn’t able to win a rematch.